I didn't actually bake these myself, but two of my roommates both made a batch: Alison made some one night and we ate so many that Julie made another batch the following day! I like that they're very warm and homey feeling with lots of ginger, they're small enough to eat in two bites, and with whole wheat flour, no butter, and no refined sugar, they're practically good for you! Alison made hers with 1/2 maple syrup and 1/2 agave nectar, which I thought was nice and not too maple-y. You could also substitute a different oil for the coconut oil, if you don't have any. I'm sure walnut oil would be delicious, and even olive oil might work. In a large bowl whisk together the flour, baking powder, salt, and oats. Add the nuts and carrots. In a separate smaller bowl use a whisk to combine the maple syrup, coconut oil, and ginger. Add this to the flour mixture and stir until just combined. 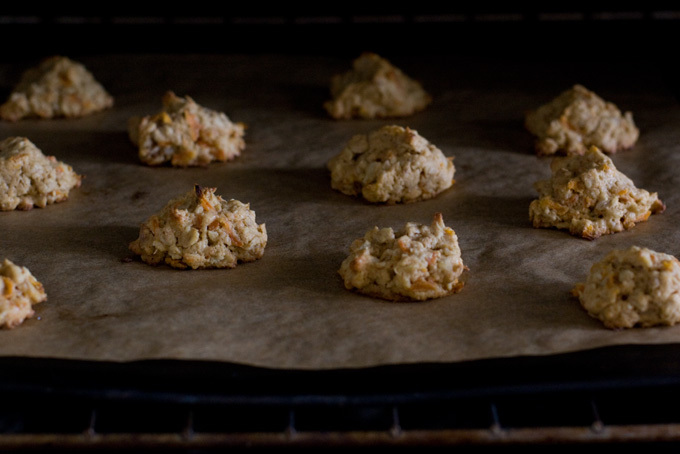 Drop onto prepared baking sheets, one level tablespoonful at a time, leaving about 2 inches between each cookie. Bake in the top 1/3 of the oven for 10 - 12 minutes or until the cookies are golden on top and bottom.